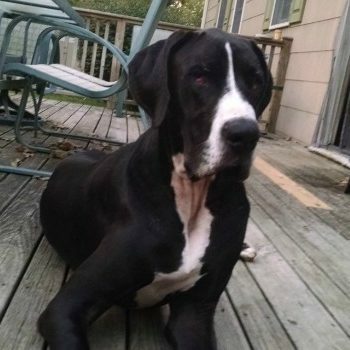 Daisy is a 3-year-old female spayed Great Dane. She is a big sweetheart. 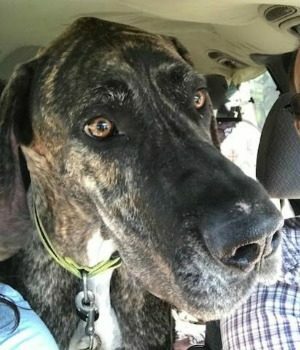 She lives in a foster home with her foster Dane brother, her foster mom, dad and teenage son and they get along great. She is trustworthy in the house, loves to go for walks with her foster brother, rides excellent in the car, and sleeps in her crate every night. She greets new people cautiously, but once she warms up its all on pet-me time. 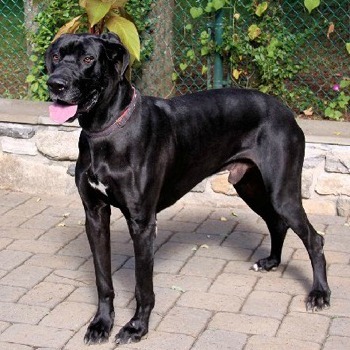 She has met small and large dogs and is very good with both, unknown with cats and small children. She loves to follow her foster mom around the house and be in whatever room she is in and just hang out. She does like to romp and play in the yard, and for her size, she is not very graceful, but is playful. She listens to commands very well and learns things quickly. 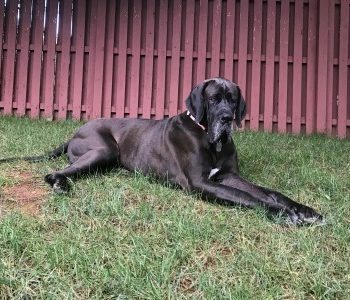 She had no problem following the other Dane and learning the routine and schedule. 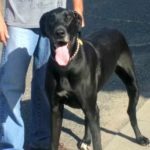 She does not like to be alone and enjoys the company and comfort of another dog, so a home with another canine will be best. She is a bit of a messy drinker, so there are lots of towels on the kitchen floor. 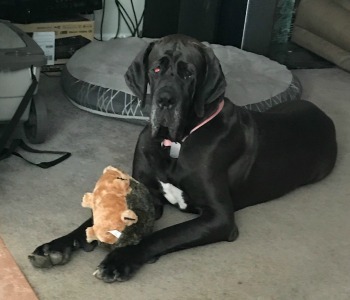 Daisy needs surgery on her eye to repair the red enlarged inverted lower lid of her right eye, it will be done very soon and then she will be available for adoption. She is a very loving dog and a pleasure to be around. 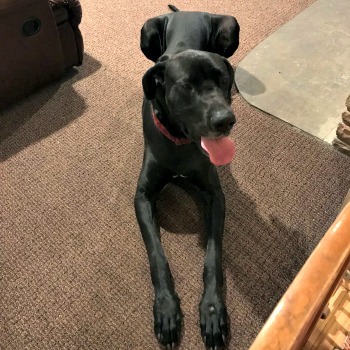 Daisy came to MAGDRL in July 2018. 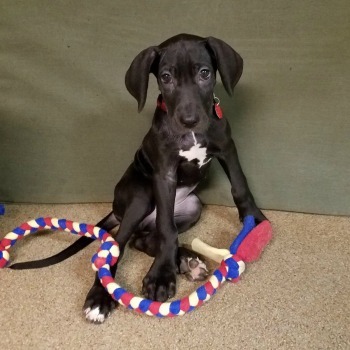 I am a little black baby female Dane puppy looking for a forever home. I love everybody I meet and hope they play with me. I am learning how to potty outside and sleep in my crate. I think I am getting it but sometimes I don’t make it, I am trying very hard to be better, I hope someone will have patience with me. I love my toys and to play with other dogs. I met the vet and the office staff and even though they pinched and poked at me, I liked them very much! I love to go for walks and rides in the car. I do have a lot to learn so I need someone willing to teach me everything I need to know. I also need a real name, they call me red collar, what kind of name is that? I hope someone will take me home soon and make me part of their family. Training agreement a condition of this adoption. Spay contract a condition of this adoption. 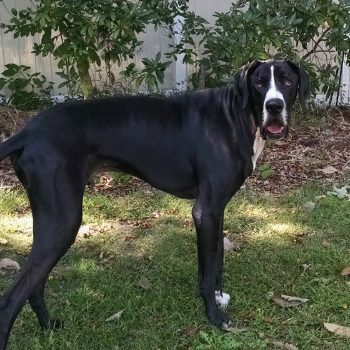 Marshall is a large handsome 3 year old harlequin marked black Dane with natural ears. Sadly he was given up by his family because the baby in the home developed allergies to him. 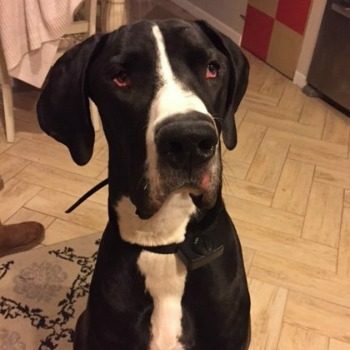 Marshall is good with children and cats and meets other dogs well. 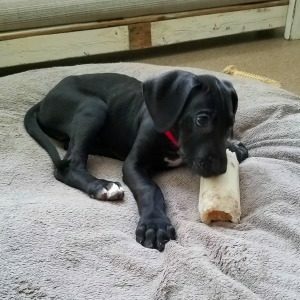 He is doing well in his foster home with a smaller female lab mix and a female Dane. 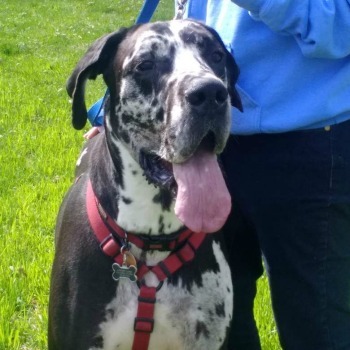 Marshall can get very excited when meeting new friends and needs work on his commands and leash walking. He can be a lot to handle with his friendly exuberance. He will need a home with an outlet for some of that energy he has. A training addendum will be a requirement for his adoption. Marshall rides well in the car and is trustworthy in the house but he will find a way to lay on the couch if the opportunity arises. 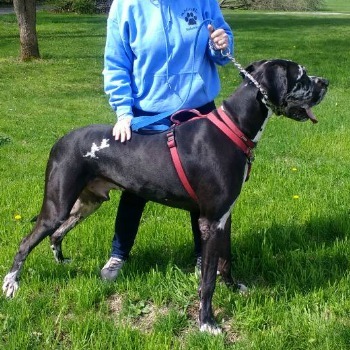 He bonded very quickly to his foster mom and will bond quickly to his adopter, he is a true velcro Dane. Marshall will be a wonderful addition to almost any home with love and time to give this sweet affectionate boy. Marshall came to MAGDRL in May 2018. 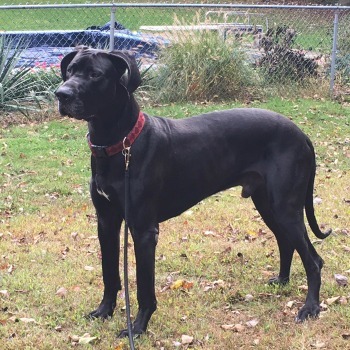 Apollo is a 3 year old, male blue dane/mastiff mix with natural ears. He came into MAGDRL due to family issues. He is a big boy weighing in at about 200 pounds. 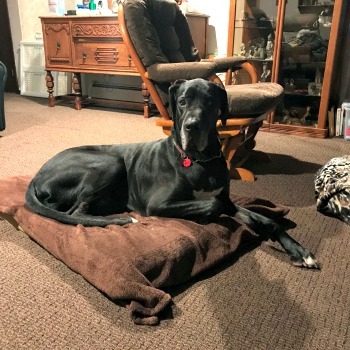 He has joined 2 other senior male Danes in his foster home without an issue and has been integrated and given full house privileges quickly. He is housebroken and has good manners around food. He takes treats very gently and gives ‘high five’ on command. Since he is so big sitting is difficult for him so he is either all the way up or all the way down. 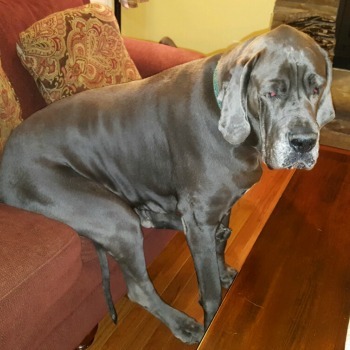 There is little in between, but he does the “Dane sit” on the couch very nicely! He is a BIG leaner and cuddler and will try to sneak up onto the furniture (as if we can’t see him). Apollo walks well on the leash and likes car rides but getting him up into the car can be a challenge. He does not jump but will put his front feet up onto the back to help. So far Apollo has not met anyone on our walks since it is so cold there are few people out but he has met visitors well with barking at the doorbell and then full leans and wags. Apollo does not like to have us out of his sight and will follow us from one room to the other and will lay at the foot of the stairs and whine for a bit at night. I am sure he would love to come upstairs and sleep in someone’s room but we have limited him to the main floor because he his not too sure on stairs. He has learned how to navigate the few steps in and out of the house but the full flight is too much for him. So for now he sleeps with his foster brothers in the living room. 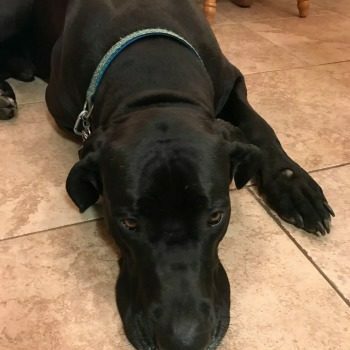 Apollo is a gentle giant and gives the softest kisses. He would be a pleasure in a house with minimal stairs, with or without another dog. He does not like to be left for long periods of time and would love to have his family home often. 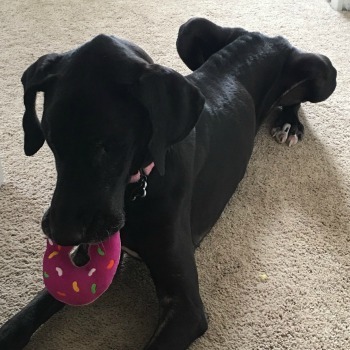 Roxy is a sweet 7 year old black natural eared female who was surrendered by her family because they did not have time to care for her any longer. 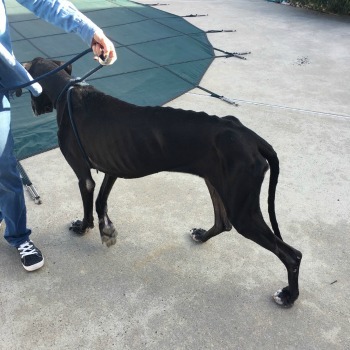 She came in to MAGDRL extremely emaciated and thin and with a terrible infection of her paws and pads. She has been on steroids and antibiotics and her foster home is working hard with the vet to get her feet healed and healthy again. 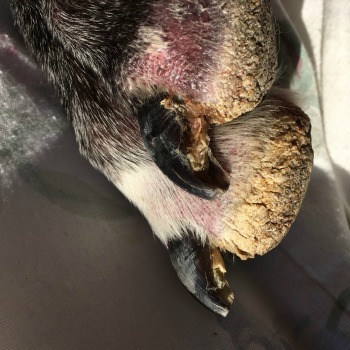 We believe her foot infection may be allergy related so she was started on a grain free diet with salmon and sweet potato. We may have to have her tested for allergies if we can’t get her feet to heal. 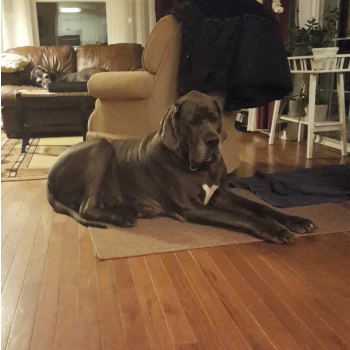 She is slowly putting on some weight, she was only 87 lbs when she came in. 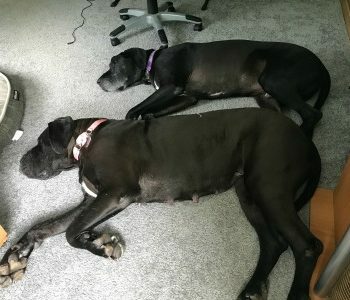 She is in a foster home with a female lab mix and they get along well. She is slowly coming out of her shell and getting more playful. Roxy is pretty mellow and very affectionate. She walks well on a leash. Until we can get a handle on her paw issue, she will be on medical hold. 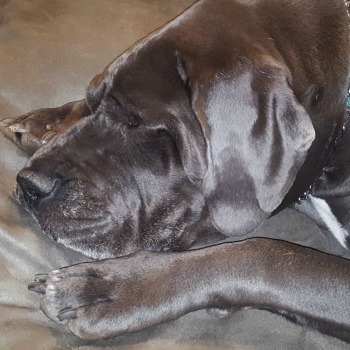 Roxy came to MAGDRL in January of 2018. 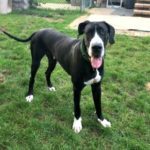 Zeus is a black natural eared male Dane who will be 7 on 12/5/17, given up because of a changing family situation. 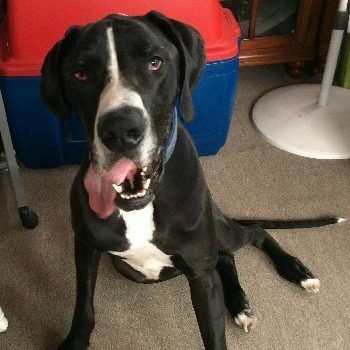 Zeus is doing well in his foster home, he is crate trained and knows basic commands. 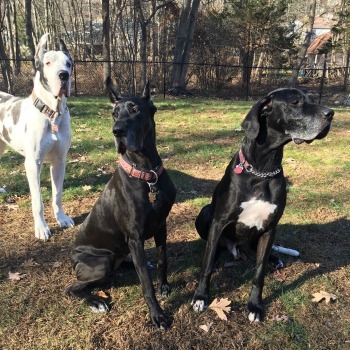 He gets along fine with his Dane foster brother siblings, one male, one female. Zeus rides great in the car and walks nicely on a leash. 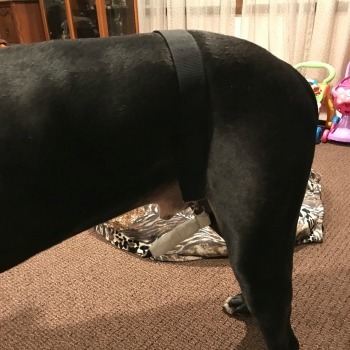 Zeus does have happy tail, which his foster mom is working on healing by clipping his tail between his legs so he cannot bang it open. It only gets unclipped when he goes out to potty. He is a good boy and leaves the belt and his tail alone. 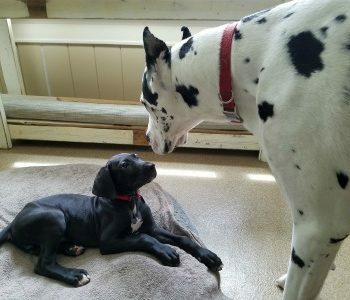 Zeus can be pushy for attention and will try and guard his people if the other male Dane tries to come in for attention at the same time. But a firm correction will make him immediately stop this behavior. 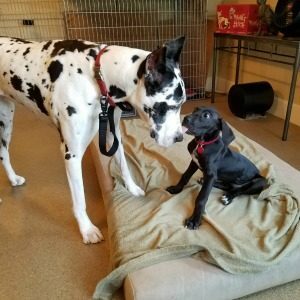 He is great meeting new people and other dogs. He did live with small dogs previously, cats are unknown. He does get nervous when small children run and squeal and will bark excitedly at them. So he will not be placed with any small children. Zeus can fit in well in almost any home, he is such a sweetheart. Zeus came to MAGDRL in November 2017. 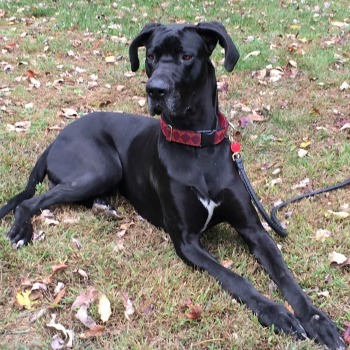 Toby is a 2 year old handsome black male Dane with natural ears. He was given up reluctantly by his owner who could no longer keep him on the estate where he worked. 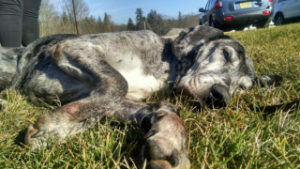 Toby was used to running free and going everywhere with his owner. He lived on a property with chickens, rabbits and horses and was fine with all. 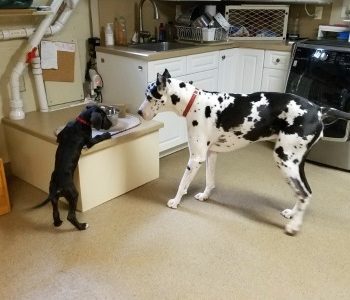 He did not live with other dogs but seems to meet other dogs with no issues. He would do best in a home either as an only dog or with female dogs of any size. We believe he will also do fine with a neutered dog friendly male. He has no history living with small children so he won’t be placed with any but he has met and interacted well with children. Toby did not know any commands when he came in, he is learning sit and has been crate trained in his foster home. He does have a very good recall. He walks ok on a leash but could use more leash work. He travels great in the car, lays right down and is very relaxed. He greets new people with leans and wags. Toby is a very playful affectionate guy, he loves his jolly ball on a robe and entertains himself playing with it. Toby is still intact and will be neutered shortly, once he recovers from that, he will be ready to move on to his forever home. Training will be a requirement of his adoption. Toby came to MAGDRL in October 2017. Hi! 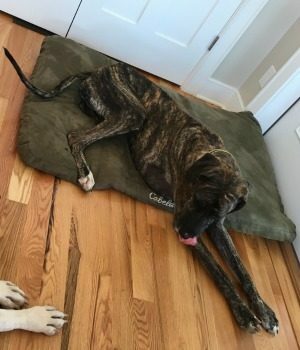 I’m Zeus, a 2 1/2 year old male brindle with natural ears! I am the sweetest, happiest guy you will ever meet!! I love to be cuddled with, and petted, and given any kind of attention. I will completely return any attention shown to me with the softest kisses. I’m not a big slobbery guy. I prefer a more subtle approach with lots of little kisses all at once. I love to play with toys, particularly rope toys. And if you throw it for me so I can chase it, even better!! I love to have the zoomies, so a fenced yard is a complete must for me. No grass is growing under my feet. It’s fun to run, and if you have kids, I would love to be part of an active family that would include me. There are no kids in my current foster home, but I’m so sweet and happy my foster mom thinks I would be great with kids. 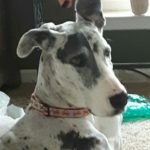 I’m currently in a foster home with a growly senior male Dane, but I totally ignore the noise he makes. He’s been pretty cool about putting up my teenage antics. I would love another dog to play with me, but I can totally entertain myself too! My foster mom works from home, and I am really low maintenance. I keep her company all day long while she is working along with Mr. Growly. 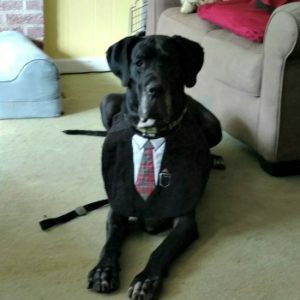 Zeus has decent obedience skills, and does not get on furniture. He is good on a leash but needs reminding about pulling. He is hyper focused on cats, and is very difficult to redirect. He will chase. And he will jerk the leash hard to run after a cat if he sees one. Zeus is not really food oriented, and can be picky about eating. He loves the car, and is willing to hop in at any opportunity! He meets strangers well-in his world, there are no strangers, Zeus loves everyone. He loves attention and will lean into any attention that might come his way. 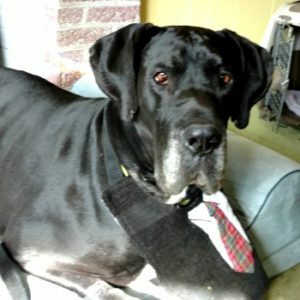 Update 8/22/17 - Chaos (or Klaus, the name his foster home has given him) has been having ongoing issues related to allergies that we have diligently been working on. 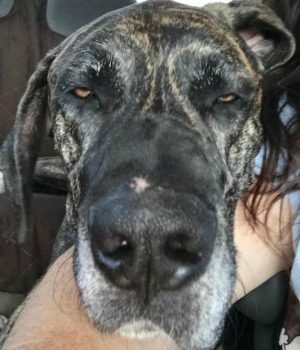 He was tested to see what his allergies included. He is allergic to many things, most significantly many grasses and trees as well as storage mites, milk and potatoes. Consequently, he gets walked on pavement only and is no longer allowed in the grassy yard. Storage mites are found in kibble, so he is now on a raw meat diet, with veggies and supplements. 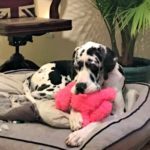 We tried Apoquel, which resulted in him getting a raging skin infection, which took a long course of antibiotics, antifungals and prednisone to resolve. He was given an injection of Cytopoint, a very expensive medication administered at the vet's office, and no improvement was noted. So he is on a regimen to manage him. In addition to his raw diet, supplements and keeping him off grass, he gets shampooed regularly with medicated shampoo. 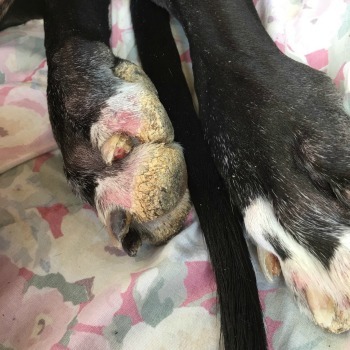 His feet are frequently soaked in Epson salts and a solution from the vet and an herbal powder with cayenne and charcoal is applied between his toes. He was also found to be hypothyroid and is on a small dose of thyroxine twice daily. Despite all this, Klaus is a love and a pleasure to have around. He is so good with all people, children and other dogs. He will need an adopter who is committed to managing his allergies and skin issues which will probably be for the rest of his life. He is worth it all, he is so loving and affectionate. Only someone totally committed to managing his health issues will be considered for Klaus. 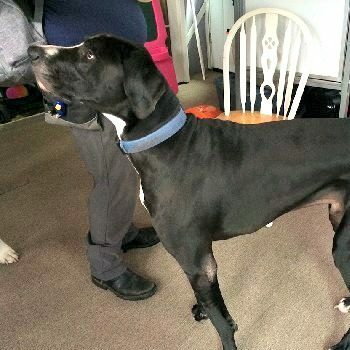 Max is a 2 yr old, almost 3 neutered male mantle Dane with natural ears. 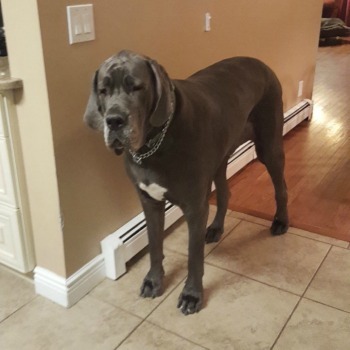 Max is long, lean and weighs about 120 lbs. 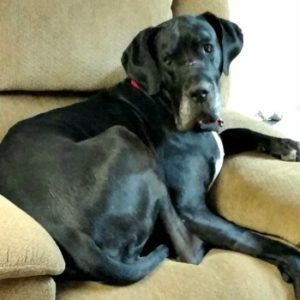 He is a typical velcro Dane, meaning he loves to follow his foster dad around the house and is always ready to sit on his lap and cuddle. Max will be three years old 11/15/17. 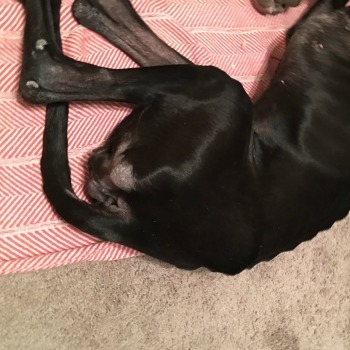 When he first came to his foster home he would often crawl around because his was unable to stand on his own at times due to mobility issues. But since then with conditioning and treatment, he is no longer crawling and getting around much better. 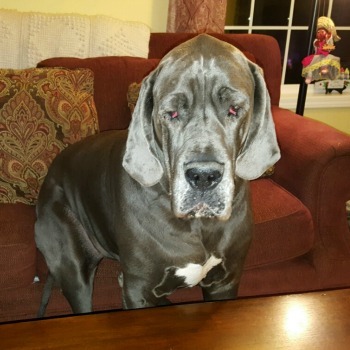 Max is currently living with a female Neapolitan Mastiff, a male Great Dane and 2 cats. He gets along great with one of the cats, but will chase and bark at the other cat when the cat hisses and swats at him. 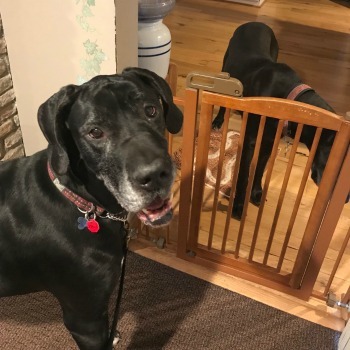 He loves to play with both of the other dogs in his foster home, but gets overwhelmed and defensive when all three are allowed to play together, most likely due his weaker hind end. He loves to go for a walk, to the park or pet store but tends to get overexcited when he sees other dogs. He will bark and jump around, but has been fine once he is allowed to say hello. 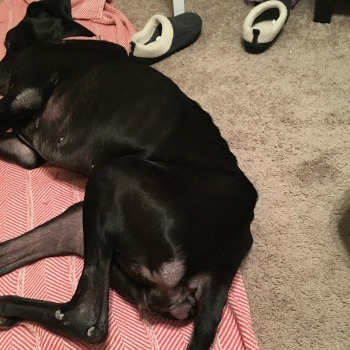 Max quickly acclimated to the daily routine in his foster home. He is extremely smart and a bit goofy at times. His intelligence enables him to open doors to let himself and his friends onto the deck or into the garage when doors are not locked. Max’s foster dad is working to curb these behaviors, as well as desensitize him when meeting new dogs in public. Max also likes to play ball when the other dogs are not around. Max has been very well behaved when new people visit his foster home and does well around people using wheelchairs or walkers. 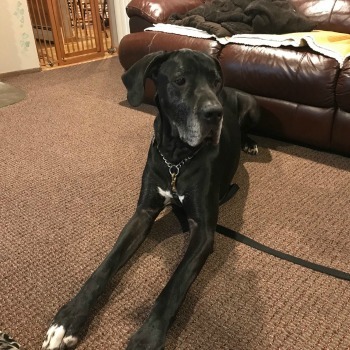 Max would really like to be with another dog, but would probably do best with a canine friend who cannot overpower him and make him feel insecure. Max is currently on Previcox and supplements. He is also receiving laser therapy treatments. 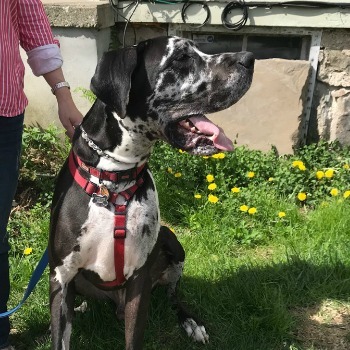 Additionally, his foster dad is encouraging him to perform simple exercises, such as walking over an agility jump, as well as going up and down a few stairs to help increase his strength and endurance. Although he no longer finds it necessary to crawl he still has a slightly unsteady and awkward gait, especially when he is tired, but his overall mobility has greatly improved and he is living a full happy life.